So, I had another good weekend, lots of fun and games. On Friday we had a Halloween party at the school for the kids, all dressed up in silly clothes and paraded around the block etc. I was in charge of the apple bobbing, but apples here are expensive so we bobbed for tangerines (and let me tell you after the 50th child has bitten into the same tangerine, the whole game starts to look a lot less appealing!). Anyway, then at about 7.30, I was just about to go home when they told me we were all going out for a staff dinner so I only had 20 mins to run home and change. We had a nice dinner, and Julie the director got absolutely smashed – she tanned about 8 bottles of beer in less than an hour, plus numerous shots of soju (sort of like Korean saki), and then dragged us all off to the Nori Bang. 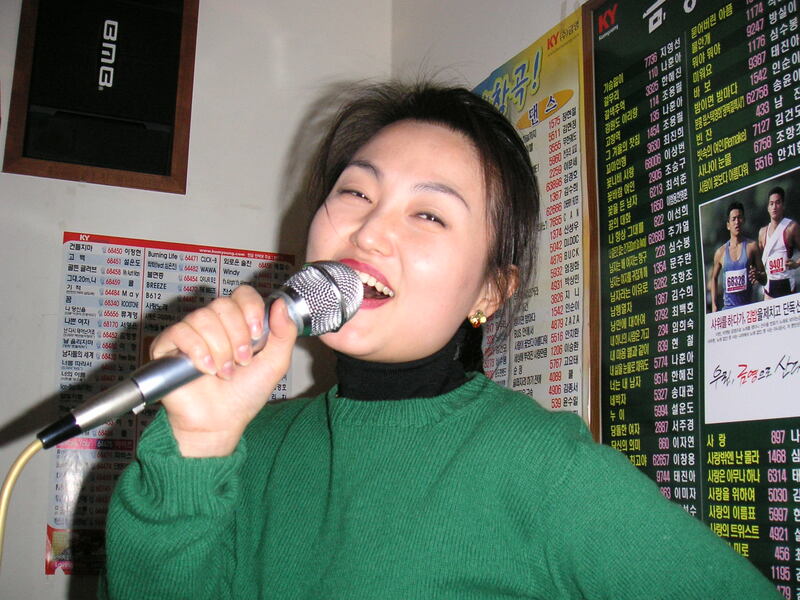 Nori Bang means literally song room – its like a private room with a karaoke machine. It was slightly scary – these women really let loose and go mad once they’re locked away where no one can see them!! My colleague Cal told me he used to get dragged along to staff nights out at his old school with all the guys, but he said that the women are way scarier! So, after an hour of singing our little hearts out, we set off for a nightclub called Hotel Castle. We lost a few girls on the way – the married ajimaa’s (that means old aunt) didn’t want to come, so it was just me, Jenny and Joanna (the only single girls left – Jenny’s 28 and Joanna’s 44 and has been divorced twice from the same man!) The club itself was amazing and bizarre – it was a serious time warp! Think late 70’s, early eighties………the stage, the live band, the disco ball, dancefloor, red and blue velvet sofas at every turn…..they even had a laser show while the band was on!! It was awesome – the waiters/bouncers gave us each personal glowstick-torches and found us a good table. There were about 30 waiters zooming around in matching grey suits and earpieces, looking remarkably like secret service agents, bustling around serving drinks in the most efficient way possible! All very exciting, except that I swiftly discovered that the girls being dutifully sent over to entertain the men were in fact us!! It turns out that in Korea it’s not culturally acceptable for women and men to just approach each other and start talking. You have to be introduced by a third party, kind of like a chaperone. Usually your parents introduce you to “nice” boys, but for those singletons whose parents aren’t very good matchmakers, there are “booking clubs” – where the highly efficient waiters act as a go-between and “introduce” you. We got dragged up out of our seats by these Secret Service guys masquerading as waiters, steered through the club and plonked at a table with some leery looking 50 year olds!! The other girls didn’t mind so much, as they’re both ‘looking for a man’ anyway, but I was frankly a little terrified at being left alone at a table full of middle-aged dirty old men who didn’t speak any English! I also got a little fed up at being manhandled around the place all night – I really just wanted to sit quietly and enjoy the atmosphere, but every time we sat down the little men swooped down and started pulling my arm -“oh missy, I find you handsome man – he young, he rike white girl vely much” etc. It was also extremely annoying that they would grab you and physically drag you out of your chair. I tried to be firm that I wasn’t interested, but unfortunately that’s another little cultural thing – the girls can’t seem too eager to meet the men, even if that’s the whole reason they are there, so they have to put up a bit of a fight, and struggle a bit while being dragged around the club, proclaiming “Oh no! I couldn’t! Leave me alone!”. So you can imagine that me telling these burly waiters “if you touch me again, I’m going to kill you” didn’t have much effect. In the end, the safest place was on the dancefloor, so we stayed there mostly, and saw some live acts that I’m told are quite famous Korean performers – pop singers, DJ’s etc. Actually, it really was a weirdly classy place – they even brought us a fruit platter with our beer, and the only real disaster (enormously embarrassing, but of course I’m going to tell you anyway) was my trip to the bathroom. I have to explain that there are three types of toilets in South Korea, the hole in the ground/squatter, the regular sit down type, and then the space-age uber-toilet. Only places like really expensive restaurants and classy clubs like this one have the uber-loo – it’s like a regular toilet, but with an electric control panel – heated seats, bidet options etc. All very technical. I ended up in the cubicle with no loo roll and no lock on the door (of course!!) and so was sat there wedging the door shut with my foot. I turned around to look for toilet paper behind me, and accidentally lent on one of the buttons with my elbow. Suddenly, this jet of water is shooting up out of the toilet straight up my arse. Not so bad, I hear you cry…….. I couldn’t find the bloody off switch, and of course I can’t read Korean, so I start manically pressing buttons trying to shut it off. A queue builds up outside, girls keep trying to pull the door open, only to find me, screaming obscenities, squirming around on the loo. Of course I can’t just stand up, because the jet’s pretty powerful and is shooting straight out of the bloody toilet, so without my rear end in the way, there would have been a fountain of water shooting straight out of the loo and about 3 feet into the air – I’d get totally drenched. So there I am, literally trapped on the toilet. Eventually I managed to hit upon the right sequence for switching it off, jump up and practically run for it out of there, pulling my trousers up as I came cannoning out of the cubicle much to the amusement of the waiting queue of giggling Korean girls! As I’m rushing back out into the club, I bump straight into Jenny, who immediately asks me why I have a giant wet patch soaking through the back of my jeans! Ah well, that’s enough excitement for now. Hope you’re all well, and avoiding technologically-advanced toilets…. This entry was posted in 2004, South Korea, Technology and tagged 2004, South Korea, Technology by worldenoughandtimeblog. Bookmark the permalink.